$295.00 In stock - low quantity. Order in the next 12 hours, 8 minutes and it will go out today! This could be the ultimate photo opp kids routine. But it's also a contender for the ultimate Pack Flat/Plays Big routines for children’s audiences. David Kaye’s Princess in a Pickle is the first set of headless silks that can be combined with a complete story -- and it uses four child-helpers onstage. 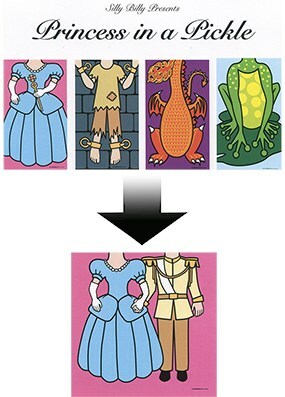 The routine tells a classic story of a princess and her answer to the difficult question: How do I decide who I should marry? Click on the video at the top of the screen and see the whole routine performed live by Silly Billy. This is 7-minute routine plays huge on any stage. It comes with printed instructions for two complete routines – one for older kids (as in the video) and, if your character is not as crazy as Silly Billy, a sweet and gentler version perfect for younger kids. You can customize your routine to fit your character and still have plenty of room for ad-libs. If you simply follow the script that comes with it, you will get plenty of laughs since the jokes are already built into the patter. On the other hand, if you like to play off the reactions of your onstage helpers, this is the trick for you. There are many moments when you ask the children questions in the routine and you never know what they will say! This makes it hilarious for the audience. And if you can ad-lib off their comments, this will make you a star. You get five silks, including the giant 42” climax silk, which is an automatic applause cue, and a Change Bag specifically chosen for use with this effect. Get Princess in a Pickle and let the classic story-telling and hilarity begin!